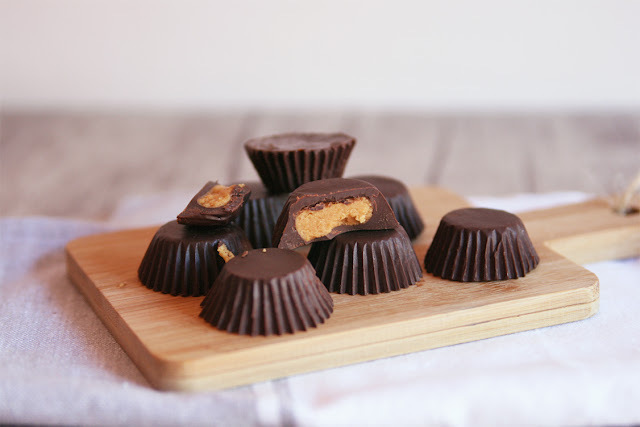 I told you in my last post that peanut butter would make another stellar appearance very soon. Well, here I am, satisfying my ice cream and peanut butter cravings. Summer wouldn't be the same without ice cream, actually the world would be a very boring place without ice cream! After making this recipe I firmly believe that I've just given Ben & Jerry's a run for their money, ha! It's so super delicious, creamy and definitely addictive. 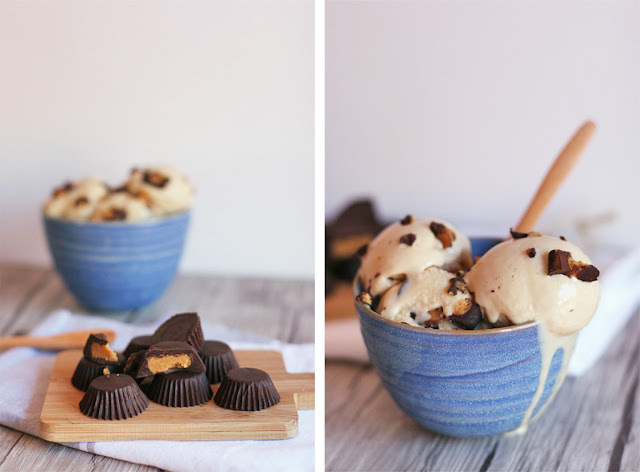 I mean, it's peanut butter ice cream with homemade dark chocolate peanut butter cups, what else can you ask for?! It's heaven in a scoop! And I almost scream of joy when I noticed ZERO ice crystals, you know what a bummer it is when you've been waiting for the ice cream to freeze and, once you get to finally enjoy it, you realize that creamy base turned into a damn big piece of ice. 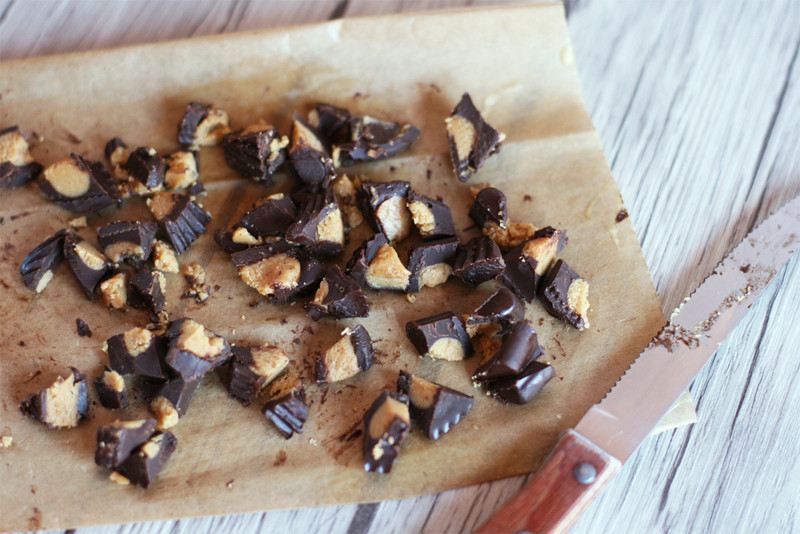 I highly encourage you to try this recipe, trust me, you won't regret it. The only thing you'll regret is not doing a bigger batch cause it's so yummy it will be gone in the blink of an eye. I had to be quick while taking these pictures cause it was so damn hot and humid that day (nothing new here, actually), the ice cream started to melt right after the first shots but I didn't want to lose a single scoop so I shot as fast as possible. Reminder to myself: next time I plan to shoot ice creams turn on the AC! Hope you are all enjoying your summer vacations and eating lots of ice creams! 1 3/4 cups unsweetened almond milk. 115 g/4 oz dark chocolate, roughly chopped. 1 tablespoon coconut syrup or maple syrup. Blend the almond milk, peanut butter, sugar, coconut syrup and vanilla in a blender and process until the mixture is completely smooth. Carefully add in the xanthan gum and blend on low for a few seconds to prevent the gum from splattering, then increase the speed to high and process for 1 minute. Pour the mixture into an airtight container, cover and refrigerate overnight or at least 4 hours. It's very important that the base of your ice cream is very cold before churning, that will help get a creamier ice cream. When the mixture is very cold, stir it a few times with a hand whisk and pour it into an ice cream maker. Churn according to the manufacturer's directions, I normally churn my ice cream for 40 minutes. 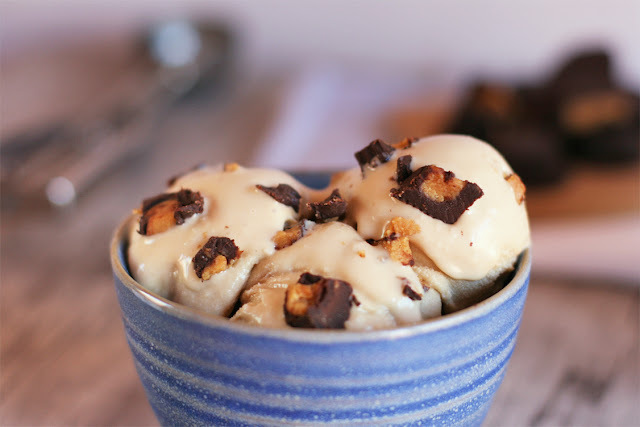 Transfer the ice cream to a freezer-safe airtight container, stir in the PB cup chunks and place a piece of plastic wrap firmly against the entire surface of the ice cream to prevent ice crystals from forming. Put the lid on and freeze until the ice cream is firm enough to scoop. 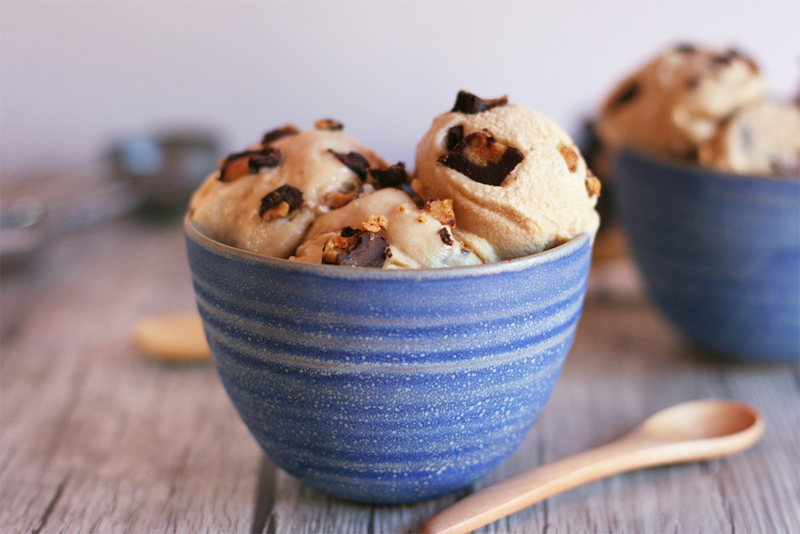 The consistency of the ice cream might vary depending on the type of ice cream maker you use. Mine is a very simple and cheap machine so I usually get creamy mixtures, yet they don't look like soft serve. A lot of recipes say that once the ice cream has been churned it should look like soft serve but don't be afraid if yours have a rather 'melted ice cream' texture. If that's the case, then I don't recommend you to add the chunks at this point. Place the ice cream in the freezer and when it's halfway frozen, stir in the chunks. 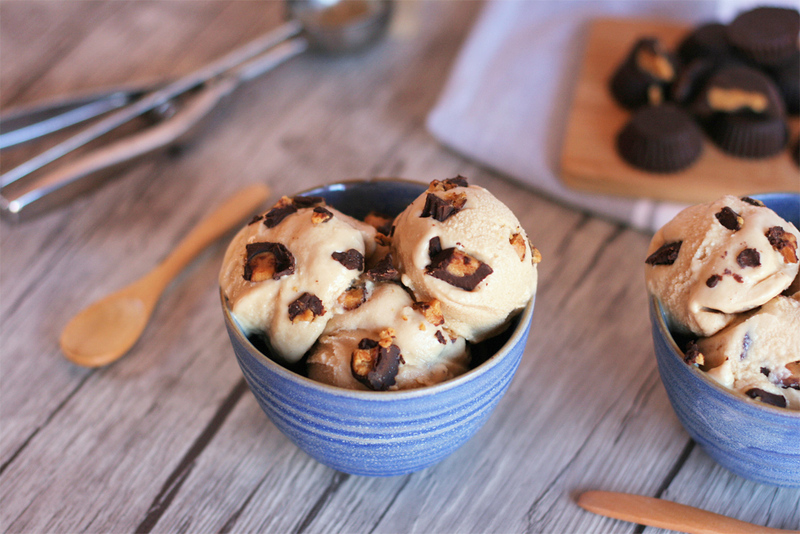 Alternatively you can leave the ice cream 'au natural' and add the peanut butter cups right before serving. 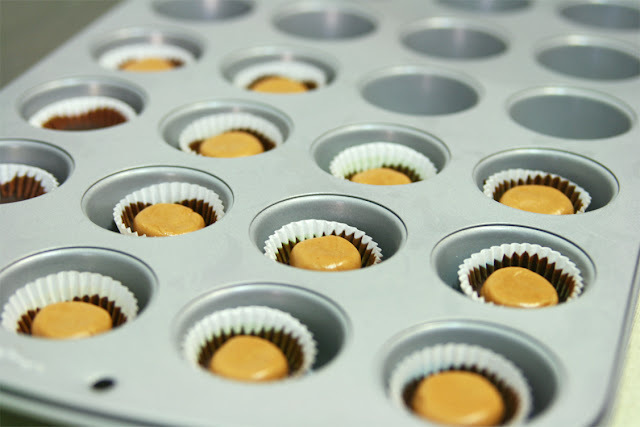 Line a mini cupcake/muffin pan with candy cups (I recommend waxed paper). Set aside. Put the chocolate and cacao butter (melted) into a heatproof bowl over a saucepan of hot water and melt stirring occasionally. Let it cool for 10 minutes approximately. In a small mixing bowl, using a small silicone spatula or fork, stir together the peanut butter, coconut syrup, nutritional yeast and salt. Pour enough chocolate into each liner so that the bottom and sides are covered, gently tilt the pan to make sure the sides are at least halfway coated. Place cups in the freezer for 10 minutes. 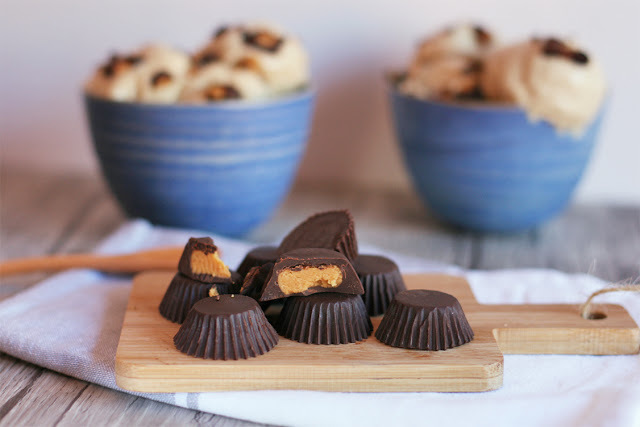 Roll the peanut butter into small balls using a teaspoon to measure and place each ball in the center of each cup, making sure it doesn't touch the chocolate-covered sides of the cup. Place back in the freezer for 5 minutes. Cover each mini cup with the remaining melted chocolate and transfer to the freezer until set, for 15 to 20 minutes. There's something so satisfying about that picture with the ice cream melting down the bowl. I know what you mean about getting excited when the ice cream doesn't freeze rock solid. I always feel like a magical wizard when I finally pull it off. Haha. Nice post! 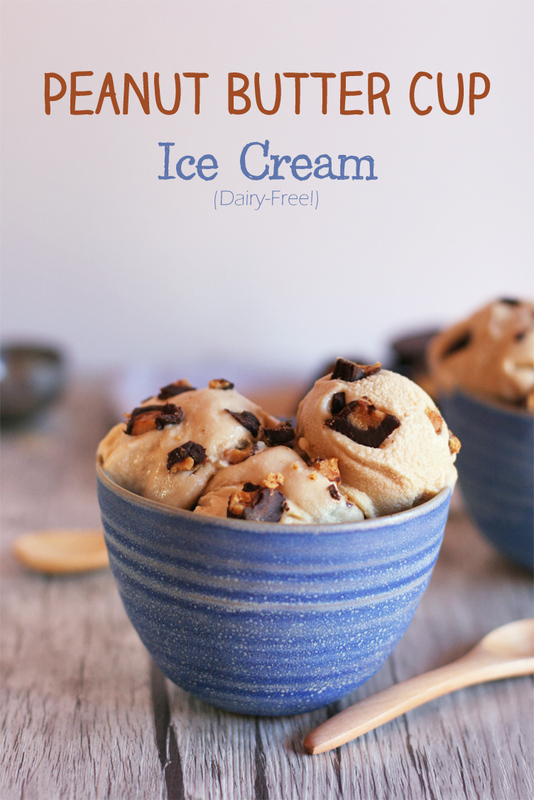 Have you seen my latest ice cream recipe? 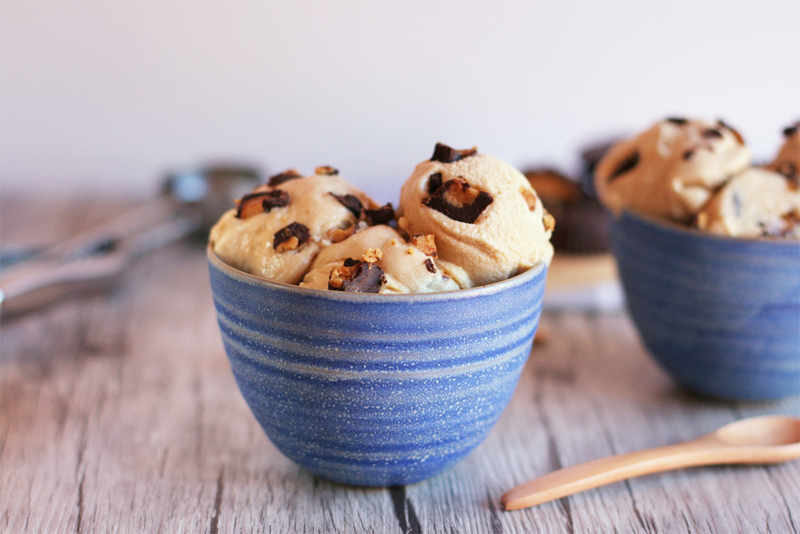 I'm thinking about combining a scoop of this PB ice cream with my new one, which is super chocolaty, I'm sure they'll make a terrific combo!